There’s a good chance that the anthropomorphic squid-kids were enough to get you on board already – having seen the filth that erodes Iwata’s faith in humanity on the Miiverse, I can say that with some confidence. But if that’s not enough for you, then we should probably explore how Nintendo of all companies was able to bring more creativity to the multiplayer shooter space than just about anyone since Call of Duty 4. At first blush (or brush?) that statement may seem perilously hyperbolic, but I stand by it. Splatoon is an utterly alien rendition of a multiplayer shooter; free from the frustrations of typical competitive multiplayer, I experienced nothing less than fun. 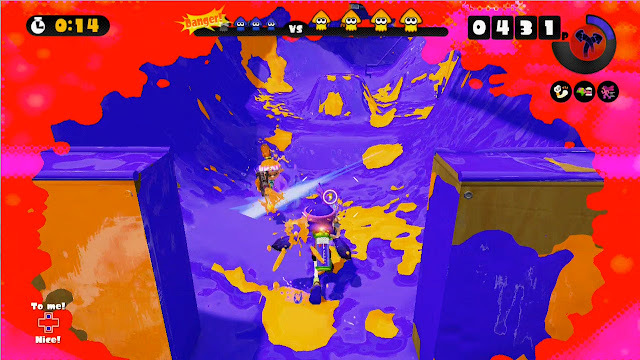 While you can shoot (sorry, splat – other players, it’s not your primary goal, rather to cover your surroundings in ink. Completely unbeknownst to me, Splatoon has a single payer campaign! Suffice it to say, it is certainly not your run of the mills shooter campaign – as amusing as a slow motion breach and clear sequence would be – rather an action-platformer of sorts. It features a series of zones, filled with relatively short, though creatively diverse missions. Only perhaps four hours in length, the single player stays interesting throughout, because of its intelligent mechanics and puzzles. 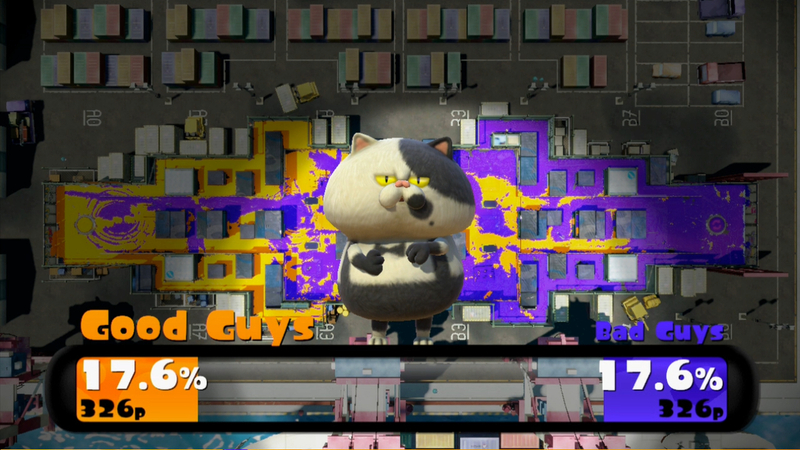 While Splatoon’s single player is a pleasant diversion, multiplayer is the main attraction. Matches are short, lasting just three minutes, low-stakes but highly engaging. 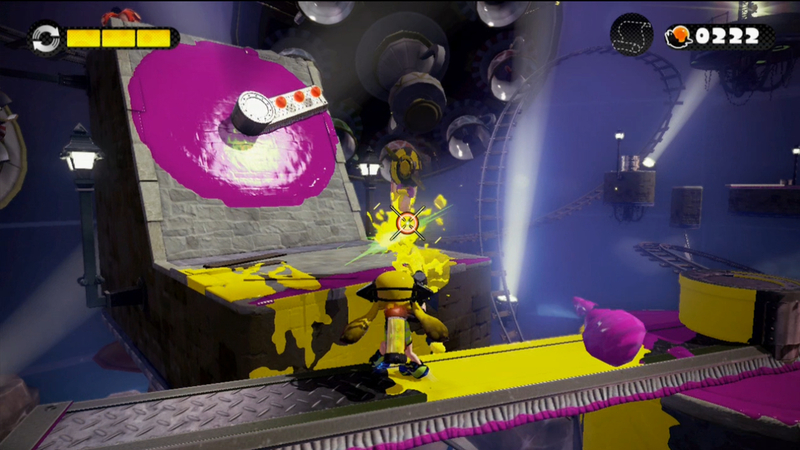 As the timer ticks down the music changes, adding to the urgency as Inklings vie for colour-filled control of the map. The game currently only features a single game mode; Turf War, where the team with the most ink on the field is declared the victor by Judd, a cool cat. Turf War is great, novel; indicative of the whole game in that sense. Though it being the sole mode is disappointing, not necessarily because of the lack of options, but rather the game demonstrates such shear creativity it is impossible to not want to see more. Additionally, there were only five multiplayer maps at launch. To that end, Nintendo have outlined an interesting plan of free post-release content, including, additional game modes and maps (the first of which has already been released), which may alleviate concerns over lack of content. There is ranked play, unlocked after reaching level ten, and a one-on-one local multiplayer mode called Battle Dojo. Your wins and losses feed into your ‘vibe’, which grants you bonus cash, but in the game’s own words; don’t worry too much about it. Win or lose, I played purely for fun, and in not a single match did I experience anything but that. While it never surfaced as an inconvenience for me personally, it is worth noting that Splatoon does not offer in-game voice chat. As an online game, it is a significant omission. However, even had I wanted to chat, I was rather fantastically surrounded by players quite evidently from all over the world, making useful communication highly doubtful. The gameplay simply isn’t complex enough to require more coordination than a glance at your map. After being splattered, you can launch your inkling through the sky by tapping on teammates on the map, which also shows the painted terrain, on the Wii U Gamepad. This allows you to get back into the thick of the ink even faster. For me, catapulting cartoon squid never lost their novelty. Furthermore, the enhanced movement and stealth capabilities of the squid-form, while in friendly ink, should not be understated. The mechanics add meaningful and wholly unique dynamics to the gameplay. There isn’t a huge arsenal in Splatoon, but the weapons available are refined and offer surprisingly different ways of spreading their garish payload. There are a few different types of guns; the rapid firing ones, like the .52 Gal(lon) and the Splattershot, and the longer range options like the Jet Squelcher, that fires bursts of ink. However, I quickly found my match with the roller, which is effectively the shotgun of Splatoon; painting a wide area very quickly. It’s really a one-hit-splat weapon, but it is ground-based only. 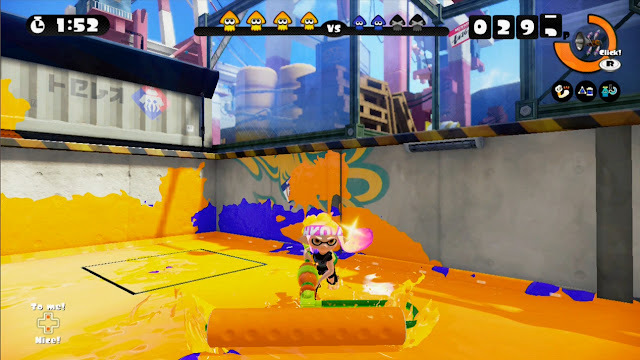 So with the exception of the satisfying flick animation when you first ‘fire’ the roller, that sends ink flying, you really can’t paint walls, curved or otherwise. It is also really easy to be splattered before you reach the bad guys. Honestly though, the only reason I use it is because, the uneven spread of the guns makes me crazy; winning is secondary, my ink needs to be neat. There is also equipment to take into consideration, including various types of grenades, and the special weapons. These are unlocked by charging the special meter and include; inkzookas (an ink-tornado firing bazooka), and the inkstrike (an ink air strike). Weapons and clothing are purchased from the shops lining the music-filled plaza. Each item of clothing bestows its own bonuses, such as faster running speed, or increased ink reserves. The plaza also serves as a miniature Miiverse hub. 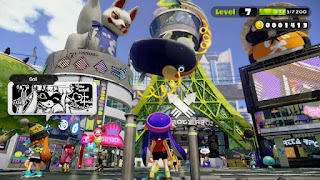 Players and their posts from all over the world are surfaced here, including the hand drawn artwork, usually accessed through the Miiverse game community. This has led me to taking laps of the plaza each time I load the game. There is some real gems in there and plenty of memes, though gratifyingly, there are even more posts complaining about the meme. When it comes to finding a match online I’ve experienced as little as perhaps a dozen seconds, to as much as several minutes, and a handful of Wii U operating system-level error messages concerning connectivity issues. When all progresses smoothly, you can be in a game remarkably quickly, which was the case most of my time. Especially when opting to remain in matchmaking after a match finishes. Splatoon has some interesting ways of ensuring the players’ experience is as smooth as possible. Only two maps are playable at a time, rotating every few hours. I have no real insight into Nintendo's decision-making process, but it does seem an intelligent way of solving the potential issue of a small player base, which would not be unlikely given the Wii U’s current install base. Furthermore, while waiting for players to connect, you can play the retro-looking Squid Jump minigame, on the Wii U Gamepad. It is effectively Doodle Jump, but markedly more engaging than reading a summary of the last match. While on the subject of the Gamepad; Splatoon features and encourages the use of motion controls, specifically for aiming the height of your reticule. Thankfully, they can be disabled in the options menu, though I did use them for several hours and got somewhat used to them before switching to regular, full control using both thumb sticks. My experience with the motion controls in no way felt natural or necessary. Remember all the vibrant, stylish promise of Sunset Overdrive? Well Splatoon brings that same oversaturated flare in bucket loads, but unlike Sunset Overdrive, Splatoon doesn’t make you want to run out of the room and vomit in dismay. Splatoon is an exquisite jaunt of beautifully garish art, buttery smooth visuals, and a terrific, high-energy soundtrack. When I’m talking buttery, I’m talking nothing but the creamiest; it delivers a consistent 60 frames per second. Much of Splatoon’s charm comes from the adorable Inklings themselves. The animation and sound effects; the floppy ear-tentacles, spry plops, and gurgling ‘brwee’ noises ensure that each play session reduces me to a sad pool of ‘aww’s and coos. While I won’t spoil a thing; Splatoon’s final boss is not only an awesome spectacle, a masterful lesson in creating rewarding encounters that naturally build in intensity, but also my favourite use of music since Starbreeze’s Syndicate. Honestly, just the most sublime sequence. Followed by the most innovative credit roll I may have ever seen. Smooth, beautiful and dripping in inky style, Splatoon is an astonishingly refreshing experience, that really defies expectations has a multiplayer shooter. The movement dynamics feel like nothing else and are particularly well-realised in the single player missions that take on a more platforming focus. The relatively low volume of content isn’t has detrimental as it might seem, the game plays so differently that having only half a dozen multiplayer maps really isn’t the problem it might be in a game like Call of Duty. Even so, Nintendo's free post-release content plans seek to remedy this. It’s inktastic.